ARM, the company that designs the architecture for most of the world's mobile processors, has revealed its next iteration of products at Computex Taipei 2016. 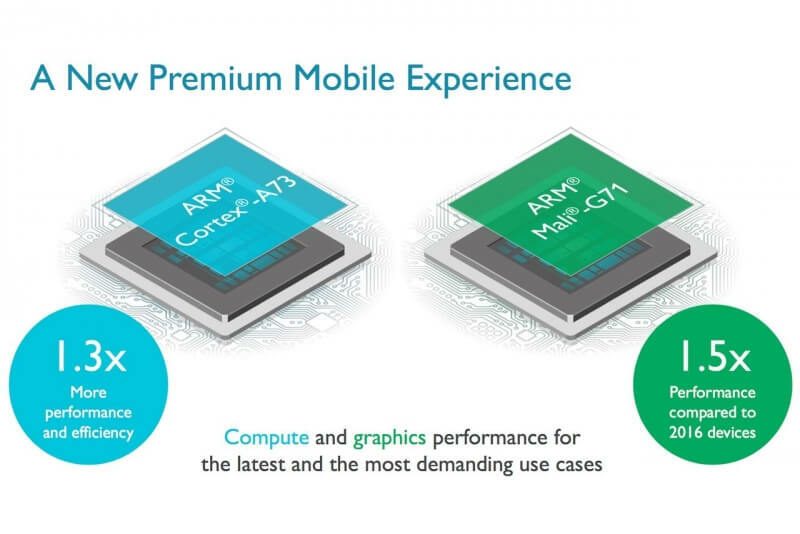 With its new Cortex-A73 CPU and Mali-G71 GPU designs, ARM is focusing on two smartphone areas: power efficiency and mobile VR. The new Cortex-A73 system on a chip is up to 30 percent more efficient than its predecessor - the Cortex-A72. It’s also 30 percent more powerful and offers around 1.3 times the peak performance. And because it’s built on a 10nm FinFET design, it’s much smaller than anything that's come before. ARM’s Mali-G71 GPU, which uses the company’s third-generation Bitfrost architecture, is an even bigger improvement over its previous generations. Compared to the last-gen Mali-T880, the new GPU offers up to 20% better energy efficiency, 40% better performance density and 20% external memory bandwidth saving. It’s also scalable up to 32 shader cores, double the number found in the T880, and there’s support for the Vulkan API, which should further increase performance. What this means for mobile VR is support for 4k resolutions, 120Hz refresh rates, and a 4ms graphics pipeline latency, all without killing a smartphone’s battery within a few minutes. "The smartphone is the world's most ubiquitous compute device, offering experiences that improve with each new product generation," said Pete Hutton, ARM executive vice president and president of product groups. "This technology can make engaging with 4K video, virtual reality, and augmented reality an everyday experience on a mobile device." Ten companies have already licensed the A73 and G71 designs from ARM, including Samsung, HiSilicon, and MediaTek. The chips should start appearing in devices early next year.